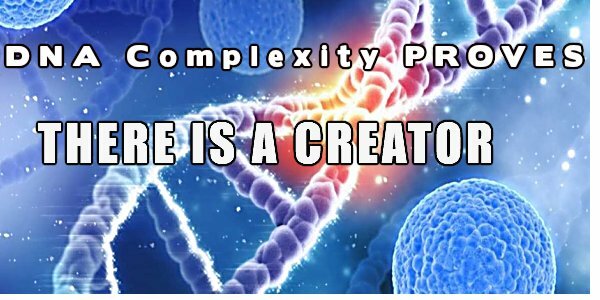 The fact is all living things are “blueprinted” by a Creator via the DNA base-pairs present in each cell. Each organism of every species everywhere on the planet is built in a womb according to the DNA “blueprint” given to that individual being at conception. Would a modern engineer try to build a skyscraper or aircraft carrier with no blueprints or engineering design plans? Of course not. That would guarantee failure. The same reality applies to all living things. Each life form must be specifically “blueprinted” from conception by an infinitely intelligent and powerful Creator Being who leaves nothing to chance. We call that being “God” in the English language. Let’s consider some more facts about DNA’s awesome characteristics. The second link and third link offer the following incredible facts about DNA. They both reveal that each human cell has about “six feet” (or “2 meters” as the second link from the BBC notes) of DNA in it. They add that there are approximately “10 billion miles of DNA” in the cells of each living human being and they try to make that superlative understandable with comparisons we can comprehend. Are you really going to believe that 10 billion miles of DNA in your body just fell into place by sheer dumb luck? When Charles Darwin posited the theory of evolution, he thought of living things as little more than adaptive tissues. He knew nothing about every cell in every organism being “blueprinted” from its beginning by the specific DNA it began within the womb. He may have had at least some excuse for his silly speculation, but modern mankind is without excuse. We now know that every cell of every organism is specifically and intelligently “blueprinted” in its DNA to be exactly what it was designed to be. The evidence for a Supreme Creator being is overwhelming and it is the only scientifically-acceptable explanation for life on this planet. Yet modern mankind refuses to accept the reality of its own Creator. Scientists are still struggling to figure out the mystery of life. The same article cited above states on page 63 concerning the whole field of DNA research: “Like parents staring at tiny toy parts and baffling assembly instructions, scientists have barely begun to figure it out.” And yet…these same scientists will likely deny the obvious truth staring at them right in their faces: That such complex design of every cell and DNA base-pair requires an Intelligent Designer to make any life possible. The denial of a Creator by modern mankind and the theory of evolution were prophesied in the Bible. Romans 1:20 states that the “invisible things of him [the Creator God] from the creation of the world are clearly seen, being understood by the things that are made, even his eternal power and Godhead, so they are without excuse.” In other words, mankind should be able to understand that there is an all-powerful Creator Being simply by looking at the physical creation itself. However, Romans 1:21-22 prophesied that mankind would “profess themselves to be wise” by denying a Creator’s existence and would, instead, become “fools.” David observed in Psalm 14:1: “The fool has said in his heart, there is no God.” David was right, and he didn’t know anything about the breathtaking complexity of how every cell is literally “blueprinted” to be what it is via its DNA. There is nothing random about life forms; they are what they are intelligently-designed to be. Yet many very highly-educated people in the modern world assert that “there is no God” and everything came into being by random chance.” I think the only resolution of this conundrum is to conclude that there are a lot of very highly educated fools in the modern world. Romans 1:23-25 predicted mankind would eventually deny the Creator God and invent a “lie” that all mankind was somehow the product of the observable animal world–a good characterization of the modern theory of evolution in 1st century AD vocabulary. Verses 26-32 predicted that when mankind “did not want to retain God in [its] knowledge,” God would give mankind over to a “reprobate mind,” which this scripture defines as mankind being given over to homosexuality and a long, rogue’s list of cataloged sins. This list of sins sounds very much like the list of sins predicted by the Apostle Paul in II Timothy 3:1 to exist among mankind in the latter days of our age (see my article, Are We Living in the Biblical Latter Days?). Although God has given mankind freedom of choice, it is very dangerous for mankind to wander too far from God’s intent for how it should live. God reserves the right to intervene and exterminate his creation if he chooses. In the Deluge account in Genesis 6-9, God decided to exterminate all humans and animals except for Noah’s family and the animals brought to the Ark by God (Genesis 7:1-9, 21-23). We have seen prophecies that latter-day mankind would also be very evil and sinful like the pre-Flood world was, and Matthew 24:21-22 prophesies that our age would, indeed, end in a planetary extinction unless God directly intervened to stop it from happening. Personally, I could respect someone who claims to be a Deist, someone who believes that a Deity created life on earth but is a member of no particular religion or religious system. At least that person can see the obvious facts of reality as Romans 1 explains them. Given the murder and mayhem wrought by Christians vs both other Christians and non-Christians in all kinds of wars over the last two millennia and given the mind-numbing superstition of Christianity in the Dark and Medieval Ages, I can understand why some cannot see Christianity (in its many forms) as a collective “one true religion.” However, I challenge any Deists among my readers to read my above-cited articles and see if they would like to reconsider the Bible itself as being the Word of that Creator Being. If they do, I think they will see the Bible is a far more scientific book than Christians have themselves represented it to be.